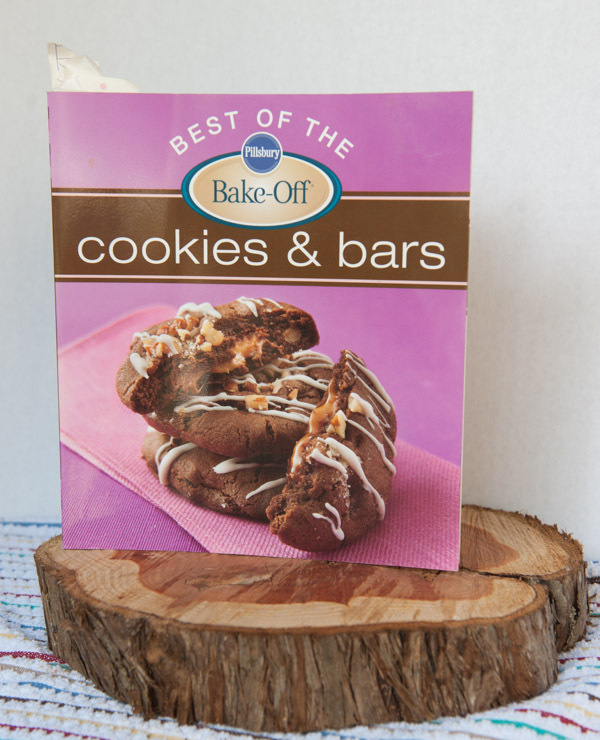 I’ve had this recipe in my “To Try” notebook for several years now. Every time I plan a party, I look at it, my mouth starts watering (You know how your mouth starts watering when you think about lemon or lime.) and I pass it up. I’m not sure why that is, but it could have something to do with the fact that I love chocolate…the real, brown chocolate…not the fake white stuff!!! I have to work really hard to force myself to make desserts that do not contain chocolate. I was planning a baby shower for my daughter, Jennifer, and her new adopted baby, Hope, and here I was again…staring at the recipe with my mouth watering! I finally decided the time was now to whip up these bars. If they weren’t so good, I had plenty of other dessert options at the shower for the guests to choose from. Well, they were really good! The next Monday, I sent the leftovers to Joel’s office to get his staff’s feedback. (I did keep the crumbs from the pan for myself…which I ate “1 small crumb at a time”!) I promptly got a phone call from Kim at his office rating them a 10 and asking for the recipe. Her comment was, “I hate coconut, but I love these bars”! That evening when Joel came home, I mentioned my conversation with Kim and asked him to take the recipe to his office the next day. To which he responded, “I told them you bought those bars!” He was in the “dog house” and was in-charge of straightening out that situation with his staff! As Joel is not crazy about lemon or lime flavored desserts, this recipe was not his favorite, but who cares…everyone else liked them. So here’s the recipe…allow your mouth to “water” away! 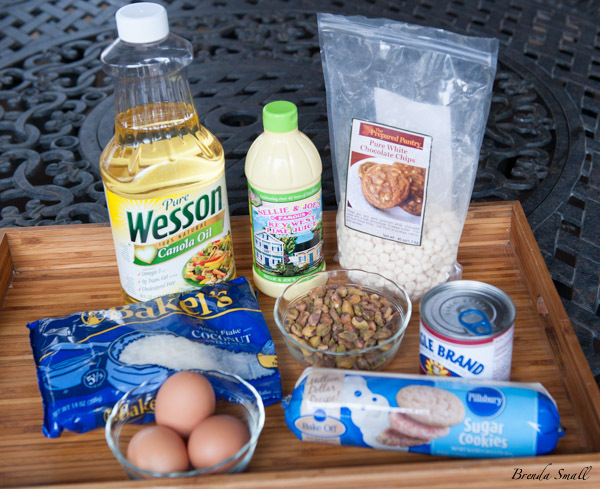 These are the ingredients you will need for the White Chocolate-Key Lime Calypso Bars. 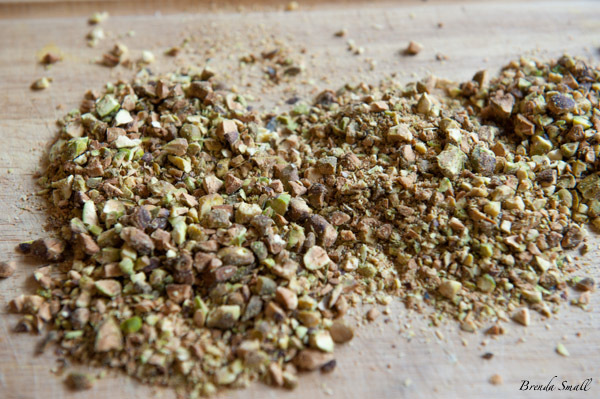 This is what the coarsely chopped Pistachio nuts should look like. I buy the shelled Pistachio nuts in a large bag from Costco. Along with all of my nuts and a lot of my flours, I store them in BPA free, freezer safe, plastic containers in the freezer. We use a lot of nuts, as we snack on them, throw them into salads and have them with cocktails. This is with the chopped pistachios and the coconut added to the batter. At this point, knead the ingredients into the cookie dough with your hands until smooth. Lightly spray a 13" X 9" baking pan with a cooking spray (I use Pam). Set aside. Place the softened cookie dough in a large mixing bowl. Using your hands, break up the dough. 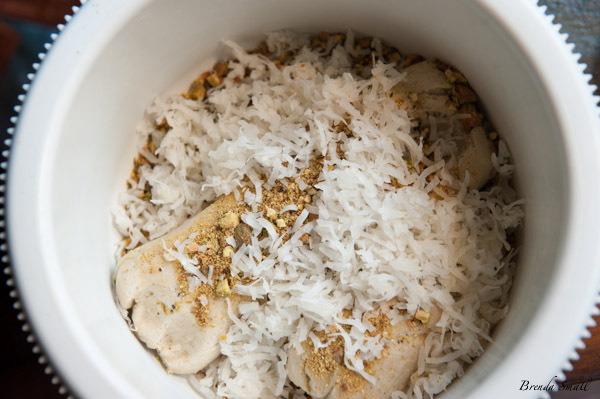 Add the chopped pistachios and coconut and knead with your hands until smooth. Press the dough evenly on the bottom of the prepared pan to form a crust. Sprinkle 1 cup of the white chocolate chips evenly over the dough. Then, lightly press the chips into the dough. Bake on the center rack of the preheated oven 14 to 16 minutes or until just lightly browned. While the crust is baking, in a medium mixing bowl using a wooden spoon, beat together the condensed milk, lime juice and egg yolks. When the crust is lightly browned, remove from the oven and cool about 5 minutes. Pour the condensed milk mixture evenly over the baked crust. Return the pan to the oven and bake about 20 to 25 minutes or until the filling is set. Remove the pan from the oven and place on a wire rack to completely cool. It takes about 1 hour. Place the remaining ½ cup of white chocolate chips in a small microwaveable bowl. Stir in the oil. Microwave uncovered on high for 20 seconds. Stir. If necessary, microwave an additional 10 seconds and stir until the mixture is smooth. Pour the mixture into a small, heavy zip lock bag or a pastry bag fitted with a small tip. If using a zip lock bag, cut a very small hole in one of the corners. Using the bag as you would a pastry bag, lightly squeeze and drizzle the mixture over the totally cooled bars. Cover and refrigerate until chilled...at least 1 hour. If they are not totally chilled, they are messy to cut!! Store, tightly covered, in the refrigerator.